zoom Located in Piazza Riario Sforza, in full "Decumano Maggiore" where you can admire the Picture Gallery "Pio Monte della Misericordia" that houses the original Caravaggio's painting "Seven Acts of Mercy". At the back of the Duomo, close to the major city attractions like National Archaeological Museum, Greek-Roman city's underground, "Conservatory of San Pietro a Maiella", Sansevero Chapel where is set the Sammartino' sculptural masterpiece the "Veiled Christ", Via San Gregorio Armeno the characteristic street where all year is possible to esteem the craftsman?s creation of "nativity scenes" for Christmas. At few steps from Universities, Hospital and shopping areas, Hotel represents, also for its proximity to the most important means of transportation, a certain point of reference, both for business and leisure customers. Piazza Garibaldi, with the Railway Station and the Circumvesuviana train for Sorrento, Pompeii, and Herculaneum is at 600 m.
The highways and the ring-road are at 700 m.
At the same distance is the Harbour "Molo Beverello" to sail to Capri, Ischia and Procida. Capodichino Airport is at 4 Km. from the Capodichino airport follow direction to Via Foria and turn on the left to Via Duomo. From the highway or ring road?s exit Piazza Garibaldi/Stazione Centrale follow signs to Corso Umberto I, at the crossroad in Piazza Nicola Amore go to the right to Via Duomo and than take Via Tribunali (the third on the right side) after 20 Mt. You?ll see the Hotel. 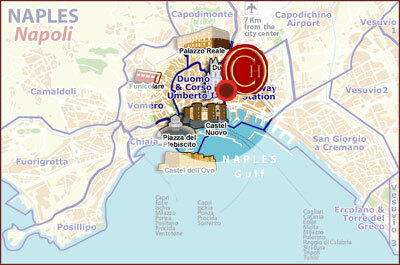 from the Capodichino airport to the railway station in Piazza Garibaldi take bus 3S or ALIBUS. From the railway station in Piazza Garibaldi at the Bus stop near the Garibaldi Statue Monument, take Bus CS get off at the second stop of Via Duomo and turn right onto Via Tribunali, continue for a short way down this street and you will see our hotel on the left.